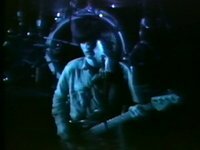 3 comments for "XTC - Science Friction, early Studio recording". Submitted by Mr Haddock on December 3, 2009 - 23:35. Was wondering whether this session might surface. Last time I viewed it was in the SV studio in 1979. A certain person, who shall remain nameless (i.e. forgotten), offered to sell me the original B/W spool tape plus any other footage of interest and a Sony VTR for £70. Needless to say I refused this highly dubious proposal (i.e. didn't have the money). Submitted by viewpoint on December 4, 2009 - 15:47. Glad you didn't, this way we can all share it! Though this came from a Umatic copy of the original. We still don't have a vtr for the black and white reel to reels so there are more jewels to come. If you hear of one please let us know urgently! Assume the 'offer' you refer to was in the distant past? What year was it out of curiousity? Submitted by Mr Haddock on December 6, 2009 - 22:03. The offer was made in '79 during the viewing. Re the VTR, have you tried the BBC VT Old Boys site or the Mausoleum Club Tech Ops forum?